Ukraine, A Chocolate Factory And The Fate Of A Woman : Parallels Like many former Soviet republics, Ukraine is considering saying goodbye to its Soviet past and signing an economic alignment with the European Union. But with the clock ticking on a free trade agreement, Ukraine is facing hardball tactics from Moscow and a demand from the EU to free its former prime minister. 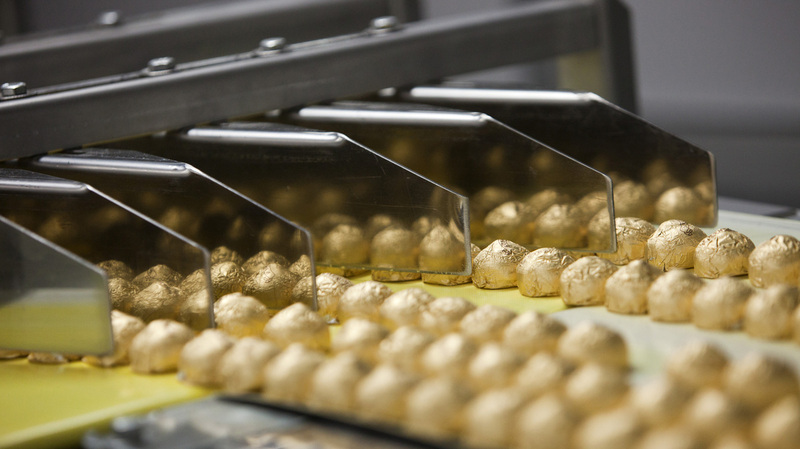 Individually wrapped chocolate-covered hazelnut sweets move along a conveyor belt on the production line at the Roshen Confectionary Corp. factory in Kiev, Ukraine. A Russian ban on Ukraine's chocolate comes at a time when the nation is considering aligning itself with the European Union. It's been more than two decades since the former Soviet Union broke apart, and to the dismay of Russia, many of the 15 former Soviet republics have spun away from Moscow's orbit. Now Ukraine — with 46 million people — has a chance to say goodbye to its Soviet past and align itself both economically and culturally with the European Union. Outside the former Karl Marx Chocolate Works, semi-trucks are ready to deliver loads of candy sold throughout Eastern Europe and the Middle East. The factory, in a shabby industrial neighborhood of Kiev, now belongs to Roshen, a giant Ukrainian company with about 3,000 workers and more than $1 billion in business a year. Inside the factory it is bright, modern and scrupulously clean. Workers in lab coats and hospital-style hair bonnets monitor machines that wrap individual chocolates in foil, with a neat twist at each end. The glittering treats that tumble off the assembly line were popular in Russia, accounting for 5 percent of the market. That is until Russia's consumer protection agency banned them. The Russians claim they found a hazardous chemical in the chocolate, but no other country has reported any problem. The timing of the ban has raised suspicions. Ukraine must decide whether to sign a free trade agreement with the European Union this month. Roshen's owner, Petro Poroshenko, is a strong supporter. "Our opportunity to sign an association agreement with the European Union is just the gate of possibilities, and [it happens] once in several decades," Poroshenko says. 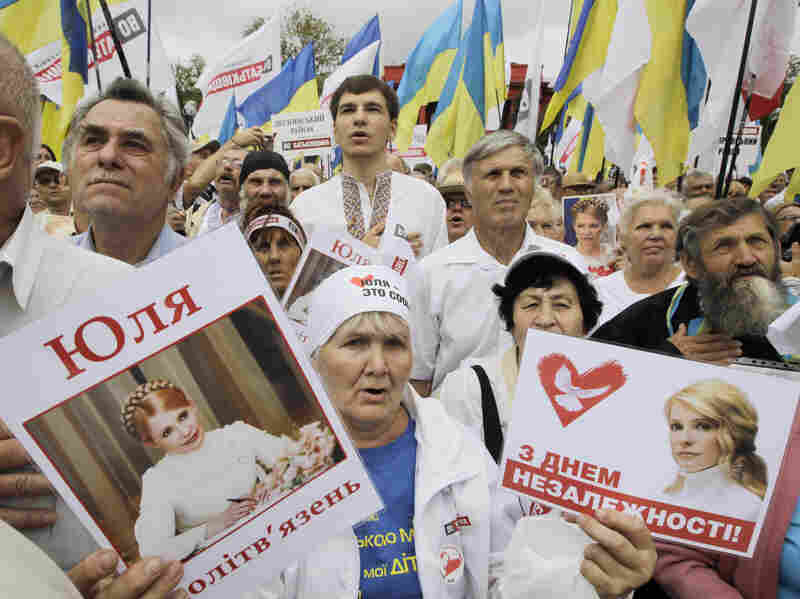 Opposition activists protest the arrest of former Prime Minister Yulia Tymoshenko in Kiev, Ukraine. The release of Tymoshenko is a condition the European Union has set in order to associate with Ukraine. Poroshenko is a billionaire who holds an independent seat in Ukraine's Parliament. He says association with the EU would force Ukraine to make democratic reforms, fight corruption and bring its manufacturing up to European standards. This, in turn, would attract investment. But Russia wants Ukraine to join a Moscow-led customs union, together with Belarus and Kazakhstan, and it is playing hardball. Besides the chocolate ban, Russia has imposed new customs rules on trucks crossing from Ukraine, backing them up at the border and driving up costs. Even if Ukraine can resist the pressure, association with the EU is not guaranteed. The EU has laid down a condition — freedom for the jailed former prime minister, Yulia Tymoshenko — the heroine of Ukraine's 2004 revolution. Tymoshenko was an icon with her fiery rhetoric, beauty and blond braid coiled on her head like a tiara. She's been in prison since 2011 on charges of abuse of power, for signing a gas deal with Russia that proved costly for Ukraine. The EU sees her prosecution as politically motivated revenge for her bitter rivalry with President Viktor Yanukovych. The Orange Revolution that Tymoshenko led derailed Yanukovych's first attempt to win the presidency. It overturned the results of an election international observers said was rigged. Tymoshenko, now 52, is suffering from severe back problems. "When I see her, you know, I have to pick her up, move her, help her to stand up, and it's evidence that any sharp movement causes very sharp pain," says Tymoshenko's daughter, Yevhenia. German doctors who've treated her in prison say she needs surgery. EU negotiators have been shuttling to Kiev, hoping to persuade Yanukovych to pardon Tymoshenko and free her, to seek treatment abroad. This is not likely, according to political science professor Oleksiy Haran at Kiev Mohila University. He says a freed Tymoshenko could challenge Yanukovych in 2015. "Actually this is one of the reasons why President Yanukovych is not going to free Tymoshenko, because he is afraid of her during presidential elections," Haran says. And that fear is borne out by some opinion polls. Ukraine doesn't have much time to decide whether to sign the agreement with the European Union. EU mediators are preparing to report within the next few days on whether Ukraine has complied with the demands to free Tymoshenko.